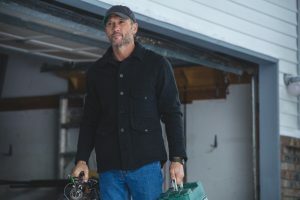 Tim McGraw stars as ‘Willie’ in THE SHACK. ©Lionsgate Entertainment. CR: Jake Giles Netter. HOLLYWOOD—Country singer/actor Tim McGraw has spoken at length about his troubled upbringing—being raised by a bipolar man whom he thought was his father and then accidentally discovering during his adolescence that his biological dad was former New York Mets pitcher Frank “Tug” McGraw, who initially rejected him and then finally accepted him as his son. McGraw, who turns 50 this year, credits the love of his family (his wife is country music artist Faith Hill) and their three children along with his faith, for giving him a remarkably happy and blessed life. In addition to being a chart-topping musician—he’s won three Grammys, 14 Academy of Country Music awards, 11 Country Music Association awards and more—he’s also a respected actor. The tall and rugged-looking Louisiana native admits he initially was hesitant to detour from his successful music career for the unchartered waters of Hollywood, but he was flattered by Schroder’s determination to get him onboard his film. After that, it was McGraw who doggedly pursued filmmaker Peter Berg to convince him to allow him to audition for “Friday Night Lights.” McGraw’s performance in that film proved that he wasn’t just another popular and gifted music artist with an inflated ego but a serious actor with chops. 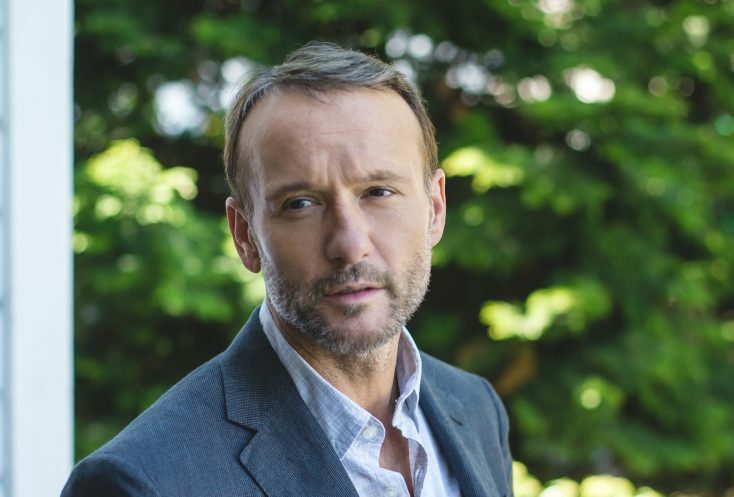 McGraw, who lives with his family on a ranch outside of Nashville, spoke about his newest film project, the faith-based “The Shack,” a story of forgiveness based on the William P. Young bestseller. He plays the best friend and neighbor to Mack (played by “Avatar’s” Sam Worthington), a man who lost his young daughter to a kidnapper while they were on a family camping trip and he is unable to overcome his grief and beef with God for allowing the unthinkable to happen. As Willie, he tries to console his grieving friend, and even offers to join him on a soul-searching trip to the shack where the battered body was found months earlier. On his solo quest, Mack rediscovers his faith through the mysterious discovery of three strangers and ultimately finds a way to forgive. The drama, directed by Stuart Hazeldine, also stars Oscar winner Octavia Spencer, Radha Mitchell and Alice Braga. Q: Family oriented roles seem to be a lot closer to what you’re playing these days. Are there parallels to that and your music? McGraw: I’m always searching for big (and universal) themes that you can just reach outside the norm of what you’re doing. I’m very family-oriented. I’ve always been family-oriented. I came from a disoriented, dysfunctional family growing up. That probably instilled in me the need and want to have a strong family and a great foundation. That’s something I naturally gravitate towards. (I’m) just looking for a great story that moves and inspires you in a way (that) I want to be impacted viscerally. Music and movie scripts are books. You want to be literally moved and that’s the sort of things I look for. When I read the script of “The Shack,” I had not read the book. My wife actually had the book on her nightstand. We’d heard about the book and knew what the story was. About a week after she put it on her nightstand, they were sending me a script to read. I read the script and was completely in an emotional meltdown. I told Faith about it and we had a lot of conversations about whether I had time to be involved because it was shot in Vancouver, and I was doing concerts and flying at 3 a.m. I was working all day, flying to do shows. Finally, we just had to do it. Q: Does this movie create the space and environment to go on one’s own journey to find peace and reconciliation in his faith or life? McGraw: Let me offer a little bit of insight into it as a tool. I need to get those insights for tools; because I don’t think that the universal themes of love, compassion, and forgiveness (are present). (You’re) searching constantly for the next step, the next level and consciousness in your spirituality, who you are as a human being and what you contribute to society or what God means to you is always a course everyone goes on. This movie does this, regardless of what your belief system is. It offers a view and perspective to you, that can open the door a little bit to think about what in your life has broken you? What in your life has propels you forward? What in your life that allows you to give up to other people, and allows you forgive others and accept forgiveness. This movie can be a cracked door with a light behind it for a life that may need it. Q: Are there are times in your life when you’ve said, “God, why have you forsaken me?” Were you wondering what was going on then? Q: Did you find the role of Willie easy or difficult to slip into? McGraw: Certainly, there’s a weight on when you go into something like this, and a responsibility that you feel. However, I think for me, what I found was, “Who would I want in my life at this particular time?” You can try but you can’t communicate what happened to this family. You can’t go into in and put something together from your life that can match the tragedy that happened to this family. You can find parallels to your life where you’ve gotten lost. (There are) parallels where you’ve gotten off track or you feel like there’s no way you can dig yourself out. There is no help for you to get out because you’ve been so wronged and so devastated. You think that you can’t find redemption in any way. For me going into this, I really wanted Willie to be a conduit for Mack. I wanted him to be somebody he could walk behind, almost like a seeing-eye dog in a lot of ways to help him navigate. Q: You take on emotional, spiritual and intellectual roles. Does it feel the same way for music? Do you get the same feelings from them? McGraw: I do. Music has to hit me in a visceral way. Sometimes I think as an artist you tend to go toward the heartbreak and the sadness because those are the deepest and heaviest emotions you can pull out as an entertainer and as a singer. Everybody loves a sad ballad because it’s cathartic. For artists, in a lot of ways, that’s sort of our therapy sessions is when you’re singing a song. You’re sort of in a lot of ways therapy sessions for a lot of people in sort of a third-dimensional kind of way that you don’t really realize. But, yeah, music has to do that for me. And sometimes it’s big themes, which I’m always looking for big themes in a way to transcend just a love story or just a fun party song. You try to find something that will connect people in different ways. This film certainly does that. I’ve been lucky a few times, musically, to be able to do that. And when those times happen, I feel like I’ve been fortunate enough to find a piece of material that would work for anyone that wanted to do it, and I got fortunate enough to be able to. Q: Is there anyone waiting for your forgiveness? McGraw: Oh gosh, I think there are more people waiting to forgive me than I need to forgive them. (He laughs.) I look at things a lot differently than that. If there are, I hope that I can discover it and I hope that I can put my finger on it and hope that I can get it. I try to give as much blanket forgiveness as much as possible in my life because that’s the only way you can get past things and move forward. But, conversely, I’d like to be forgiven. In many ways, that’s the bigger leap, the bigger transformation and the bigger step forward. Q: How would you answer someone who questions how God is portrayed by Octavia Spencer in this film? McGraw: That was the first sort of acting thing that I did, if you can call that acting. Q: Is that what got you into it? McGraw: No, but I was a fan of Jeff’s. Certainly, being southern and growing up in the south and seeing Jeff in my early 20s get his start on his TV show but that didn’t give me the acting bug or anything. Q: What was it for you? McGraw: I was always interested in it. I did a few plays early in my (career). I didn’t do any in high school but I sure remember in elementary school doing “The Music Man” playing Winthrop Paroo and (singing), “Oh ho, the Wells Fargo wagon is comin’ down the street…” So that had a real impact on me and I loved doing it but I was an athlete. All through junior high and high school I was playing basketball, baseball and football. I was always involved in athletics. When I sang, I sang in church and I sang at people’s weddings, that sort of thing. That was where I got my start. I wanted to act, but I was in the middle of my music career. When you get in the middle of a career and you’re successful, people come and offer you things. My biggest fear was that if you try to do something else and you’re trying to build your music career, and then you say, “I’m going to go do a movie,” and you’re terrible, you can really hurt your music career because as a musician, the goal is to be cool. You’re playing the guitar and you’re in front of all these people and your vibe is to be as cool as you can possibly be. When it comes to film, you’ve got to drop all that. That can’t be part of the load that you carry into a movie. You can’t say, “I’m going to try to be cool at all cost when I do this,” because that’s the opposite of what you need to do as an actor. It took a while for me to reach the point where I felt comfortable enough in my career that I could step into an acting role and not be cool and not ruin my music career. I had no intentions of doing anything and I played (a gig) in Phoenix, and Rick Schroder came to the show and was a big fan and he came backstage and he wanted me to be a part of this independent film he was doing called “Black Cloud.” He wanted me to play the sheriff and I didn’t want to do it and I wasn’t ready to do it. But he was such a nice guy, and he was face to face with me and asking me to do it at my show, and he’s one of the sweetest people you will meet in your life, and I couldn’t say no. I said, “Uh, OK. Alright, I’ll do it.” And then I showed up and did a great job on this little independent film about a native American boxer and I really enjoyed the role of playing sheriff and I learned so much. Q: How do you view that experience now? McGraw: It was like a light when off and I said, “OK.” Now seeing it from afar and watching myself do this I think I can understand this a little better. And a little time went by, and I had this script “Friday Night Lights,” that I’d never read. I remember Faith was cooking dinner and the kids were really young and I didn’t really have anything to do that night. The “Friday Night Lights” script was sitting on the counter so I picked it up and started thumbing through it and I finally got interested in it and sat down and read the whole thing. I grew up in Louisiana, and I grew up with a dysfunctional family with some very serious abuse from my stepfather, who could be a very beautiful person on one hand and be terrible on the other, so it leaves your soul troubled as a child. So I read this part in “Friday Night Lights” and I instantly connected to that character and knew that guy and knew, not based on one specific person, but elements of that character from all the world that I lived in, playing baseball and seeing parents drunk and getting in fights with referees and umpires and coming into the dugout and yelling at their kid, all those sorts of things that I saw growing up and being a part of in the sports that I was in and the area of the country that I grew up in, those sort of things just sort of flooded me, and I knew I had to do this (role in “Friday Night Lights”). I went in and read and left not knowing how I did. Faith and I went to Paris to shoot a video and I got a phone call from Billy Bob Thornton and he said, “I just talked to Pete Berg.” I knew Billy Bob a little bit, not much. He said, “I talked to Pete Berg and he said he had a country singer come in and audition for him and blew him away. And I think you’re going to get the part.” The next day Pete called and gave me the part. Q: That sounds like there was a divine hand involved. McGraw: Absolutely. I know. It’s still one of the favorite things I’ve ever done. And then I did another movie with Pete called “The Kingdom,” which is still one of my favorite films as well.